There’s more than one way to keep cool during the hottest days of summer. In fact, sipping on a frosty beer or treating yourself to fresh oysters may be among our favorite ways to beat the heat. The following suggestions both lower the temperature and increase your “cool” factor, all while providing the very best fun and adventure. If you happen to check out 815 Cocktails & Provisions in Manchester, then make sure to say hi to co-owner Sarah Maillet. Sarah was recently featured in our July issue. Three speakeasies across the state hearken back to the Prohibition days when, behind well-hidden doors, the moonshine flowed freely and the house band played the only the hottest of jazz. The soundtrack these days may sound more 2017 than 1920, but the vibe at these gin joints is as authentic as it gets. You can barely drive two miles in New Hampshire without finding a craft brewery, but, for a less-expected summer bevvie, trade your beer for a NH-made cider. Rollinsford’s North Country Hard Cider is the local scene’s king, but Farnum Hill Ciders of Lebanon, Pup’s Cider Company of Greenfield and Londonderry’s Moonlight Meadery all make ciders worth sipping. Looking for more from New Hampshire's beer scene? 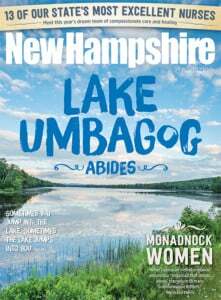 Check out www.nhmagazine.com/beer for great beer pubs, specialty beer stores and a map of local breweries. If you're not into oysters, but dig fresh lobster, then check out this list of 10 not-to-miss lobster shacks along the seacoast. It’s perhaps no surprise that a coastal state like ours has a thriving community of oyster joints. Several seafood and fine dining restaurants across the state offer buck-a-shuck nights, but, for an Instagram-ready, foodie-friendly take on the briny bivalve, head to Franklin Oyster House or Row 34. These Portsmouth eateries — sister establishments to Moxy and Boston’s Row 34, respectively — are located just a block apart and serve up wide-ranging lists of locally farmed mollusks. There are lots of great places to find handmade ice cream in the Granite State, but these seven are some of our personal favorites. We were torn when it comes to the ice cream-rich Seacoast — both are excellent.